Don’t drop the ball just yet! New Year’s Eve has a way of sneaking up on people, and if you haven’t had the chance to plan anything other than your guest list to a tentative party, here are some great last-minute ideas that will delude your guests into thinking you planned ahead! Of course, there are countless ways to spend the night, but here are a few ideas that serve as an alternative to the over-hyped and expensive ways to spend New Year’s Eve. Whether you are celebrating the New Year with that special someone or you plan to fill your home with your friends and family, this is the perfect occasion not to hold back. 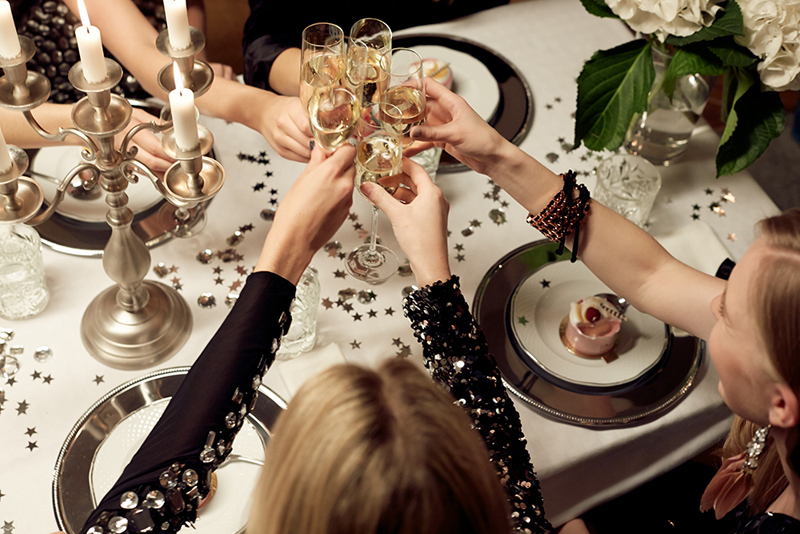 Host an elegant soiree by encouraging your guests to wear their party clothes. You may want to throw in some fun props such as boas, tiaras, hats, noisemakers and horns for good measure. The extra amusement will not only accessorize apparel, but it will set the party atmosphere. Make it a BYOA (bring your own appetizer) event. Ask your guests to bring some easy finger foods that require little preparation such as raw vegetables, fruit, nuts and cheese with crackers. This will keep you and your guests till you have dinner. As for dinner, opt for a romantic candlelit dinner following midnight. After the countdown and noisy fun, have your guests gather around the table to share a meal and their hopes for the New Year. In order to be a thoughtful and gracious host, make sure to provide your guests with both alcoholic and nonalcoholic beverages, so that your guests who do not drink will not feel pressured. There is no need to be a mixologist to pull off impressive drinks. You can find a myriad of festive drinks online to cater to groups. Along with your drinks, be prepared to share a toast or two throughout the evening, so you can kick off things for your guests and have them participate. Have a great New Year’s party! Remember to drink responsibly and to take it upon yourself as a host not to allow any of your guests drive home intoxicated. Happy New Year! First, you need to get your seating arrangements down pat. The sectional is the family-friendly alternative to its counterpart, the sofa. There are a variety of configurations, making it easier to fit the intended space. Families often seek comfort and practicality, which are both found in sectionals. Besides, a sectional is perfect for snuggling under a blanket with a hot cup of cocoa, while you watch a Christmas movie. However, if you’re not the snuggling type and you need your own space, consider kicking back on a recliner to personalize your comfort and viewing experience. 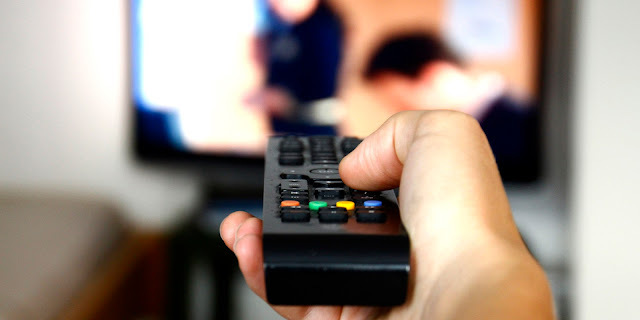 Now that you have your seating nipped in the bud, you are on your way to making your viewing experience quite magical. Apart from your seating, you may want to rest your feet. 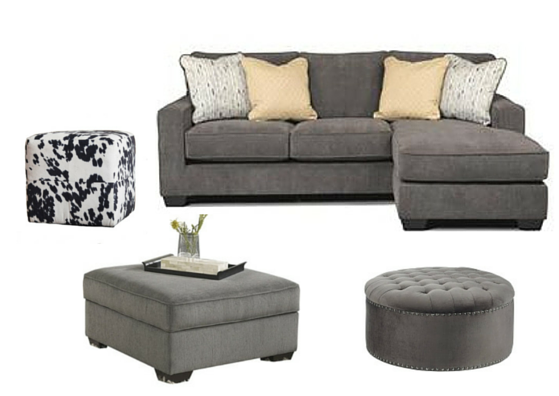 If resting your feet beside you is not an option, why not mull over a pouf or an ottoman. Not only are they currently very trendy, but they can solve a seating problem (as additional seating) and are great to rest tired feet upon. In addition, for those with a sweet tooth, you can always use your pouf/ottoman to support a tray full of tasty treats. Watching Christmas movies with your family in the right atmosphere is the perfect way to usher in the season. Happy Holidays! Are you hosting for the holidays this year? As you know, hosts have a lot on their plates. This implies that your work will be cut out for you long before your guests arrive. In order to pull off an elegant get-together, whether it is a sit-down dinner or a cocktail party, you need to consider whether you will be in a position to accommodate your guests. The question remains, do you have the appropriate furniture for hosting this season? Here are some smart buys that have multifunctional use. Are you looking to replace your sofa? Or are you having difficulty coming up with sleeping arrangements for guests that are coming from out of town? 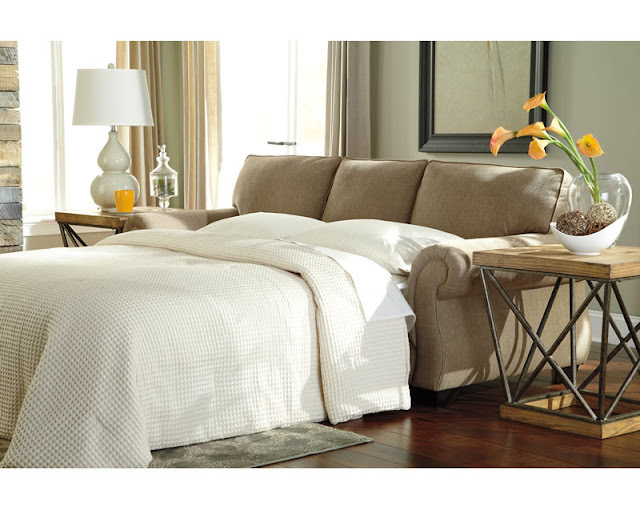 Then why not consider purchasing a stylish sofa that transform into a queen-size bed? Not only will you wind up with a beautiful sofa to seat your guests and that meshes perfectly with your home décor, but it would provide the perfect retreat for overnight guests. It’s a win-win situation. There are a few dining room hacks that can help you execute a successful dinner party. Ideally, the most accommodating dining table would have a leaf extension. That way, seating your guests will be a breeze. If you do not have such a table or cannot attempt to purchase one, contemplate buying a bench, especially since current trends favor mixing styles. This gives you freedom to purchase a bench that doesn’t necessarily match! By using a bench, you can maximize the seating around your table, as the other chairs being replaced by the bench will be additional seating. 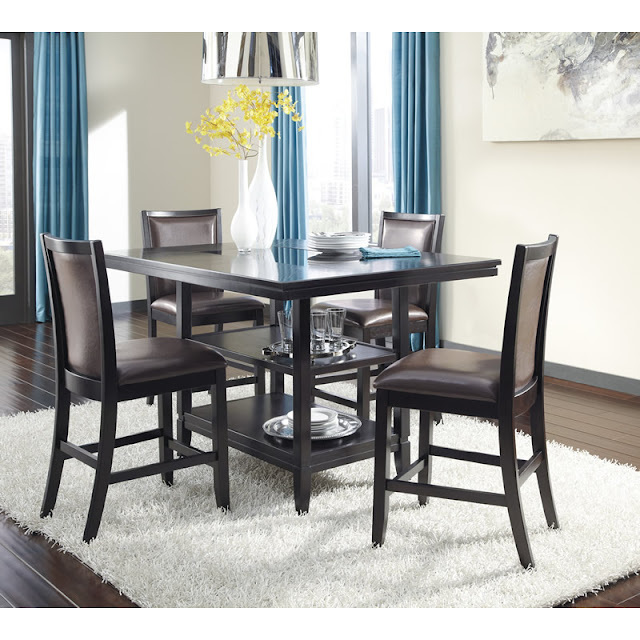 However, if you plan to host a self-serve meal to avoid the fuss of figuring seating arrangements, you may want to look at the practical “Trishelle” dining set. This set has shelving below the table, which can be convenient to pile plates, cups and cutlery below the food you want to display. There you have it, your perfect buffet sidekick! The dining room is not the only room you should examine when thinking about serving your guests. Your living room can feature convenient pieces such as an ottoman, which can serve as a foot rest for your guests would like to enjoy some television or as a tray to serve your perfect Christmas cocktail drink. The ottoman is not the largest purchase you can make, but it is quite nifty. Next is the famous coffee table that meets storage. The “Vennilux” coffee table is a masterful blend between style and practicality. 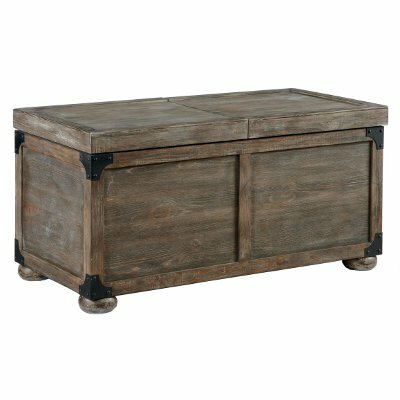 This storage crate allows you to store pillows, throws and even poufs you may want to pull out for additional seating! Happy hosting and more importantly, happy holidays! In our last video, we covered how to evaluate your needs when shopping for online furniture. Now that this part is ironed out, you are ready to proceed with purchasing online. Watch this video to learn about secure websites and best practices. Happy shopping!